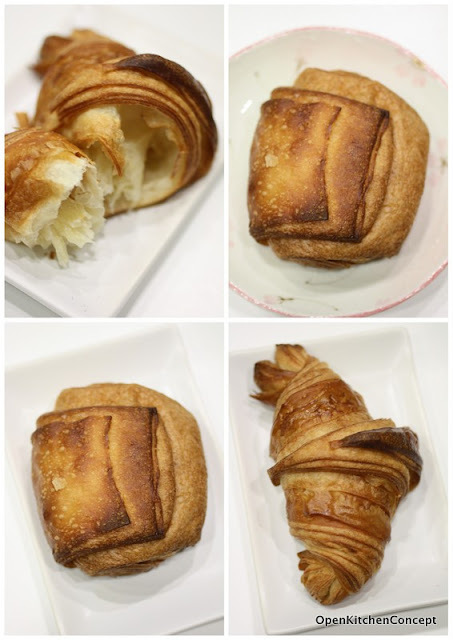 Forget about the croissants from Maison Kayser or Dean & Deluca, these croissants from Tiong Bahru beat all the other croissants I've eaten in Singapore hands down. I've always thought that because Singapore is so humid, it's impossible to get crispy, yet fluffy croissants in Singapore unless you have them pretty fresh from the oven. But these croissants from Tiong Bahru Bakery prove that it is possible to have crispy croissants in Singapore, even if you are not having them beside the oven door. The Husband bought these after work today and we had them at about 8pm in the evening. I was very impressed by how these croissants look and how crispy they were. They look so perfect I thought they were fake! These croissants are so crispy the flakes on the outside are crunchy. The layers on the outside are so distinct you can peel them off layer by layer. The inside is fluffy and soft, with a nice buttery taste that is not too overpowering. The plain croissant is slightly sweet, which is just the way I like it. The chocolate croissant is pretty good as well.. equally crispy and with a little bit of sweet, moist chocolate that leaves you wanting for more. I first came across Tiong Bahru Bakery when we visited Orange Thimble, and there was such a long queue at the bakery that Sunday. They have recently opened a branch at Raffles City Shopping Centre and The Husband bought these after work with no queue.. so hurry there before the word starts spreading! Wah... looks good! Ok, let me check out these croissants at Raffles City!